A key component of Iowa Gov. Terry Branstad’s 2014 campaign pledge to expand broadband Internet access to areas of rural Iowa got a big boost recently, it was announced at his weekly press conference today. But, it will come at a cost to taxpayers of more than $600 per household added. • Mike Shultz, Vice President Regulatory and Public Policy of Consolidated Communications. The broadband internet expansion is made possible by $53.2 million in grants from the Federal Communication Commission’s Connect America Fund. The fund was created in 2011 to foster growth in broadband access by transitioning funding that was supporting rural landline service to broadband service. CenturyLink will be receiving $17,893,887 to build out broadband to 34,827 locations. Windstream will be receiving $28,672,554 to build out broadband to 44,930 locations. Frontier Communications will be receiving $4,240,587 to build out broadband to 5,438 locations. Consolidated Communications will be receiving $2,393,216 to build out broadband to 3,019 locations. Reynolds connected the announcement back to another key campaign component: Connect Iowa. 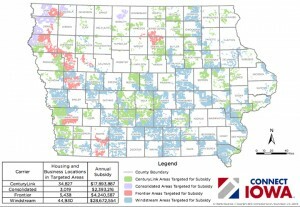 She said, to date, 19 Iowa communities have become certified “Connected Communities.” She said the certification demonstrates those communities’ “commitment to continued economic growth by embracing the opportunity presented by 21st century technology. 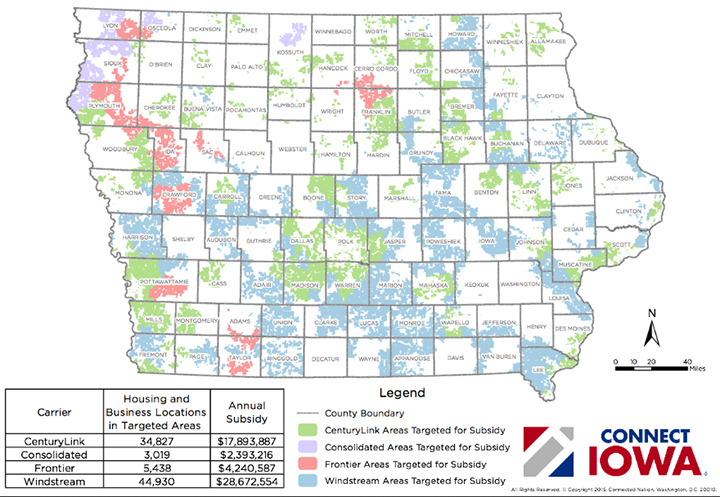 “As an elected official who grew up in rural Iowa, I know that a key part of maintaining continued growth in all corners of our state is our vision to connect every acre with broadband Internet and becoming the most connected state in the Midwest,” she said.